The Lions went down swinging. There's no other way to describe the West Linn football team's 38-26 loss at Sheldon in Friday night's Class 6A state quarterfinals. Hamstrung by four turnovers and down big at halftime, the Lions saw their defense pitch a shutout in the second half and battled back on offense before finally running out of time and opportunity. "Coach (Chris Miller) always said we were our worst enemies this year," said West Linn senior lineman Ryan Seth, a first-team all-Three Rivers League pick on both sides of the ball. "We had a lot of mistakes, but in the end, I'm proud of how we played. We came together as a team and we just worked together as a squad." "The defense pitched a shutout in the second half — they didn't score at all — but the offense just couldn't get it done," said West Linn senior running back Dawson Jolley, who rushed 20 times for 180 yards and scored three of his team's four touchdowns on Friday night. "We had four turnovers, and like I said before, we can't win games when we have that many turnovers in a game." "The way it's been going this season, the games we lost, we felt like we could have won," said senior wide receiver Cade Knutson, who finished with seven catches for 146 yards. "We didn't do well in the first half, not at all, so we were just like 'We've got to step it up and at least finish at 100 percent.'" With the loss — it snapped the sixth-ranked Lions' three-game winning streak — West Linn saw its 2018 season end at 8-4 after previously tying for third in the Three Rivers League. The Irish, meanwhile, extended their winning streak to six games and lifted their season record to 10-2 after previously winning the Southwest Conference title. While the Lions fell short of an upset against talented Sheldon, they pushed the Irish to the end in a hard-fought battle. Next up, Sheldon will face second-ranked Clackamas — the defending state champion — in the semifinals at 5 p.m. Friday at Hillsboro Stadium. The Cavaliers beat No. 7 Liberty 59-21 in their quarterfinal contest. While the Lions fought valiantly in the second half, the first half couldn't have gone much worse. On the third play of the game, Sheldon senior quarterback Michael Johnson Jr. connected with senior wide receiver Zach Folsom for a 61-yard touchdown and a 7-0 lead just 31 seconds into the contest. The Lions answered in-kind, however, marching 78 yards on the ensuing possession to score when Jolley — who had a 66-yard run on the first play of the series — burst into the end zone from 2 yards out. Sheldon's Jack Folsom blocked Abdul Ali's extra point to keep the Irish ahead 7-6. On its next series, Sheldon showcased its solid rushing attack, with Johnson carrying three times for 23 yards and senior running back Matthew Burgess doing the rest, rushing three times for 37 yards, including a 24-yard run over the right side to make it 14-6 with 5:22 remaining in the first quarter. Then, on West Linn's next offensive play, senior quarterback Ethan Long fumbled the snap in the shotgun formation and Sheldon senior Austin Lasby recovered at the Lions' 28. Six plays later, the Irish were back in the end zone, this time with Burgess going around left end, breaking a tackle and scoring from 16 yards to make it 21-8 late in the period. West Linn turned the ball over on downs near midfield on its next possession, and from there, Sheldon scored in 10 plays, getting 16 yards on a tipped pass caught by Zach Folsom, and later, a 5-yard TD dive by Burgess to boost its lead to 28-6 midway through the second quarter. There was more excitement left in the first half, too. Sheldon's Jack Olive picked off a Long pass less than a minute later, and four plays after that, Irish kicker Jay Kartub hit a 25-yard field goal to extend his team's lead to 31-6. The Lions responded this time, getting a 78-yard Long completion to Knutson to get deep into Sheldon territory. Then, facing a fourth-and-goal from the Sheldon 4-yard line, junior wide receiver Casey Tawa took an end around to the right side, then threw to senior wide receiver Jake Mastrandrea for a 4-yard score that brought the Lions within 31-13 with 1:33 to go in the half. Unfortunately, even that was too much time to leave the Irish. Sheldon drove 59 yards in just 1:17 to score again, getting a 34-yard Johnson throw to Zach Folsom, and then, a 3-yard Johnson scramble for another score and an imposing 38-13 halftime lead. "Of course we were disappointed about our first half, but there was nothing we could do, nothing we could change — we just had to go forward and finish strong," Knutson said. And that's just what the Lions did. They shut out the Irish the rest of the way, added one touchdown of their own in each of the two remaining quarters, but couldn't quite get the big plays they needed to seriously threaten Sheldon's lead. 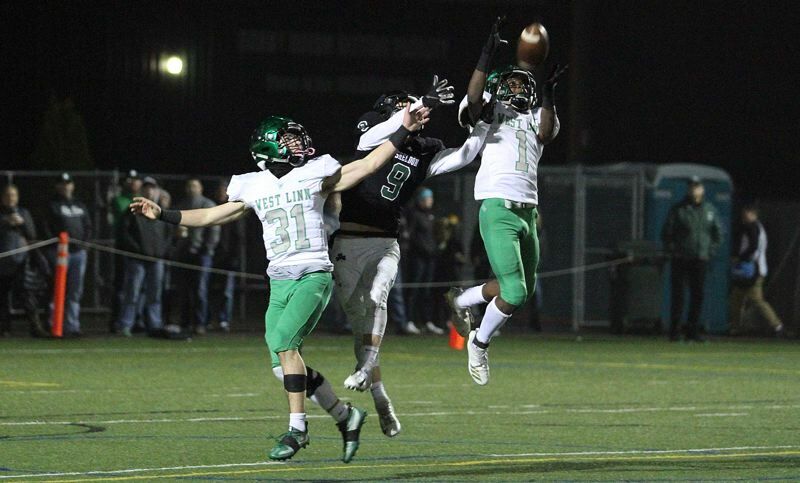 The two teams traded turnovers to open the third quarter, with West Linn senior Tanner Moore fumbling the ball away on the half-opening kickoff, and senior teammate Brodie Corrigan picking off Johnson in the end zone a minute later. After another trade of possessions, the Lions marched 87 yards for their next score, with Long going 3 for 4 passing for 26 yards and Jolley finishing the drive with a 30-yard dive up the middle that cut Sheldon's lead to 38-20 with 2:08 to go in the third. West Linn's next drive was perhaps the most crucial possession of the game. The Lions drove deep into Irish territory, but there, facing third-and-goal from the five, Long's pass toward the end zone was picked off by Parker Wiles at the 2-yard line to prevent a West Linn touchdown. The Lions' defense forced another Sheldon punt on the following series, and from there, the offense pieced together a 50-yard scoring drive highlighted by four straight Long completions for 40 yards and capped by Jolley's 3-yard TD run to make it 38-26 with 3:52 left in the game. But the Irish ran the clock out from there and sealed their bid to the semifinals. On their side of the field, the Lions were clearly disappointed but also appreciative of their many successes in 2018. "(I'll just remember) the camaraderie and the way we all came together. This was one of the tightest-knit teams to come from West Linn," Corrigan said. "We just had to band together every single week in and out. It just shows that fight that this team has. I love every single one of these guys and I'm proud to be part of this team, part of this family." "We started off sloppy ... but we came together as a unit so I'm proud of all my guys," Seth added. "At halftime, the main emphasis was we have to leave everything out on the field. Forget about the scoreboard, just give it your all. At the end of the game, and make sure you have no regrets." For the game, Johnson ran 19 times for 81 yards and one TD, and completed 6 of 12 throws for 131 yards. Burgess finished with 27 carries for 134 yards and three touchdowns. "It was very frustrating, but that's the struggle we had all year," Jolley said.